Our preferred wood species is Engelmann Spruce. 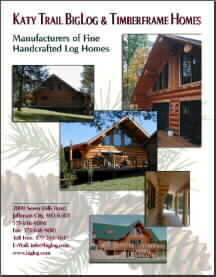 Also available are Wester Red Cedar and Pine. Our logs are T.P.I (Timber Products Inspections) Graded. Every log is PREMIUM grade with a 12"" to 14" minimum mean diameter..
Lateral joints are handcrafted Swedish scribe fit construction. The corners are shrink to fit style, a saddle-notched corner that features a tight fit which is self adjusting. Wall Logs, Beams, Floor Joists, Purlins and Ridges, and Posts are all hand peeled and crafted from premium stock. Log ends, archways, and end curls are sanded smooth and edge chamfered for fine appearance and to facilitate accurate reassembly. Log stairs consist of half round stringers and treads, with mortise and tenon construction. They are handcrafted directly onto each structure and are re-installed during log re-assembly at your site. Your logs never hit the ground! They are handcrafted in the log yard, loaded directly onto trucks and re-assembled from the trucks onto your subfloor. No unloading, sorting, dirtying......this is the most efficient system available. Total time to craft, deliver and re-assemble is typically less than any other log system.